Video still from The Guardian of the protest on Friday in Charlottesville. This past weekend erupted into ciaos in Charlottesville, Virginia when counter-protesting created conflict that has left one protester dead, two state troopers dead due to a helicopter crash, and more than 30 people injured. This weekend has started a conflict not only in Charlottesville, but nationwide with those questioning the President and his connection to white supremacy. 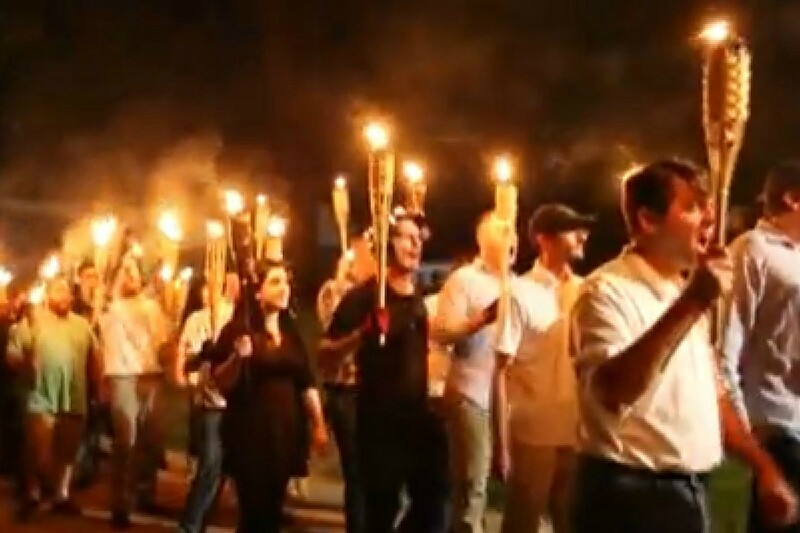 The weekend of events in Charlottesville began on Friday night when a group of “alt-right” men and women carried torches around the University of Virginia’s campus. The group chanted things such as “White lives matter,” “Blood and soil,” and “Jews will not replace us.” There were also counter-protesters present who in return chanted “No Trump, no KKK, no fascist U.S.A..” There were a few fist fights and shoving, which lead to at least one person arrested and several minor injuries. The next day, more white supremacists and neo-Nazis carried through with their planned “Unite the Right” event that protested the removal of the Confederate General Robert E. Lee statue in Emancipation Park (formerly known as Lee Park). This protest was also met with counter-protesters, which eventually led to physical violence. The conflict escalated when a “Unite the Right” protester James Alex Field Jr. drove his car through a crowd of counter-protesters, in which he is now accused of second-degree murder for the death of Heather Heyer. President Donald Trump tweeted about the matter on Saturday afternoon. Politicians from various parties called out President Trump for not condemning the white supremacists, KKK, or neo-Nazis who were present Saturday and for not calling the events domestic terrorism since Trump has been quick to call out radical Islamic terrorism in the past. On Monday, Trump held a short meeting with press, to which he condemned the KKK, neo-Nazis, and white supremacists by name. Some people are worried why it took so long for the president to denounce and condemn those hate groups. This situation sounds familiar to when Trump was on the campaign trail and was reluctant to disavow David Duke, a former KKK leader. Duke attended the protest on Saturday and said, “This represents a turning point for the people of this country. We are determined to take our country back. We are going to fulfill the promises of Donald Trump. That’s what believed in. That’s why we voted for Donald Trump.” Many of the protesters on Friday and Saturday were wearing Trump’s “Make America Great Again” hats. After Trump’s statement on Monday, Duke blamed the media for Trump’s condemnation of those groups in tweets and a Periscope video. He said that he thinks it is ridiculous that the President felt that he needed to make the statement on Monday. Some Americans have reacted to Trump’s handle of the situation by protesting in front of the Trump Tower on Monday night as the President returned to the building for the first time since his inauguration. Trump was met with signs that condemn Nazis, Confederates, and even the president himself. They were chanting “You have blood on your hands,” and “Shame on you.” There was even an inflatable balloon that resembled Trump as a rat, which got a lot of attention in the street and online. With everything that has happened since Friday, numerous people are asking why there are still Nazis and KKK members in America and why they seem to be getting more attention. 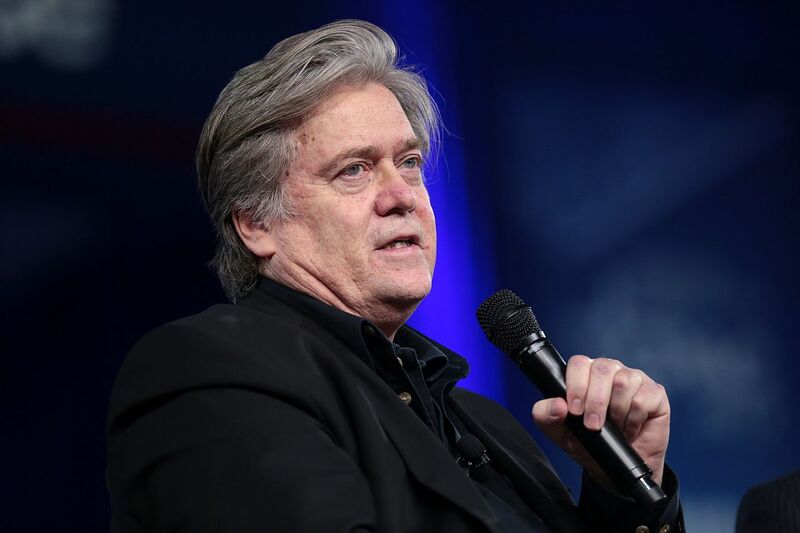 According to the Southern Poverty Law Center, an increase of accepted hate and the idea that America is a white man’s country came from the President and his White House Chief Strategist, Steven Bannon. Steve Bannon speaking at the 2017 Conservative Political Action Conference. Photograph by Gage Skidmore. Bannon used to be the executive head of Breitbart news, an alternative right publication that contains hate speech against multiple different groups. With Bannon in the White House, those who are “alt-right” feel as if they have a representative in the highest office. Trump has been no help to create that feeling as well due to the many occurrences he has used discrimination or hate speech: He called Mexicans racists and drug dealers, retweed white supremacist messages, created a Muslim travel ban, and encouraged violence towards counter protesters at his rallies. Since Monday, six business leaders have left Trump’s manufacturing council in reaction to the President’s remarks to Charlottesville. Those companies include Intel, Under Armour, Merck, AFL-CIO, and Walmart. Trump reacted to the first quitting from Merck, saying in a tweet that CEO Kenneth Frazier “will have more time to LOWER RIPOFF DRUG PRICES!” He reacted to the other companies leaving the council on twitter as well. On Tuesday, Trump held a press conference at Trump Tower on the matter in Charlottesville and the companies who left his council. Similar to his initial statement to Charlottesville, Trump blames both groups of protesters. “You had a group on one side that was bad and you had a group on the other side that was also very violent. Nobody wants to say it, but I will say it right now,” said Trump on Tuesday. Since this announcement, many politicians have spoken out about their disapproval of the President’s remarks. The list so far includes Senate House Majority Leader Mitch McConnell, Mitt Romney, Senator Lindsey Graham, Senator John McCain, Speaker of the House Paul Ryan, Senator Brian Schatz, House Minority Leader Nancy Pelosi, Senator Mark Warner of Virginia, and more. In the past, the KKK has worn hoods in part to hide their identity, but now it seems that those who are part of any white supremacists group are no longer ashamed to promote their hateful and racist agenda. The reason why is because the President has advocated the country to be a white man’s country due to who he chooses to associate with and what he chooses to say. The controversy continues to evolve on the matter as The New York Times reported on August 16th that Trump’s Strategic and Policy Forum are debating how to proceed. This forum has some of the country’s top business leaders and many are expected to resign and the council potentially disbanding.